The best place to retire for hundreds of thousands of retirees from the U.S. and Canada. This brief guide to retirement in Mexico to provide some insight into this huge country with many contradictions. Mexico stretches from the Pacific Ocean and the Sea of Cortez in the west to the Gulf of Mexico in the east, and from the U.S. border in California, Arizona, and Texas to Guatemala in the South. There are coastal areas, desert areas, lakes, and mountains. Some towns and cities are home to more expatriates than others. The Baja Peninsula, Guadalajara, Lake Chipala, Matzatlan, Puerto Vallarta, and San Miguel de Allende are some of the more familiar expat destinations. Monterrey and Querataro City are two other beautiful old cities that are less expat oriented places to retire. See our Directory of Mexico Retirement for reviews of more than 25 towns and active communities. Updated Nov. 2018. Owning Property. Americans can own property and pass it on to their heirs. They can live here permanently, although there are some restrictions. Having a reputable attorney is critically important. A Notario is required to help complete any real estate transaction. You should be aware of the risks inherent in purchasing real estate (including time shares) in Mexico, and should exercise extreme caution before entering into any form of commitment to invest in property there. Mexican law and practice regarding real estate differ substantially from the United States. Foreigners who purchase property in Mexico may find that property disputes with Mexican citizens may not be treated evenhandedly by Mexican criminal justice authorities and in the courts. Living in Mexico. Living here for a time is imperative, as many people who move here abruptly have later come to regret their decision. Mexico has its pluses in its weather, low costs, unbelievable scenery, and mostly friendly people. But it also has its downsides in terms of corruption, inefficiency, dangers, and slow pace of life. Some folks love retiring here, while others hate it. You have to choose where you retire carefully, and see it for yourself. Medical care is widely reported to be first-rate, with doctors doing house calls and quality procedures done for a fraction of the U.S. cost. In fact medical tourism is a big industry with people coming here to have expensive operations, plastic surgery, and dental procedures at favorable pricing. U.S. Medicare is not accepted in Mexico, but Americans can purchase health care insurance from the national insurance program at about $300 a year. Many writers indicate they are pleased with the quality of Mexican healthcare. If you cannot speak fluent Spanish it is a good idea to bring a friend as interpreter however. Guadalajara has several excellent hospitals including Hospital San Javier, Hospital del Carmen, and Americas Hospital. Taxes: Mexico has a value added tax. Property taxes are low relative to the U.S. U.S. residents who own a home in the U.S. and derive most of their income outside of Mexico will generally not have to pay Mexican income tax. But they might have to pay more taxes in connection with the sale of any Mexican real estate. This is a good source of basic information about Mexican taxes. Crime and Security: Mexico has earned a reputation as a dangerous place and in some cases it is well deserved, depending on where you live. Mexican law enforcement standards are probably different than most U.S. citizen are accustomed to. Here is what the U.S. State Department says about crime and security in Mexico: "Crime in Mexico continues to occur at a high rate and can often be violent. Street crime, ranging from pick pocketing to armed robbery, is a serious problem in most major cities. Carjackings are also common, particularly in certain areas. The homicide rates in parts of Mexico have risen sharply in recent years, driven largely by violence associated with transnational criminal organizations. Ciudad Juarez and other cities along Mexico's northern border have particularly high murder rates. The Mexican government makes a considerable effort to protect U.S. citizens and other visitors traveling to major tourist destinations. Resort areas and tourist destinations in Mexico generally do not see the levels of violence and crime reported in the border region and in areas along major trafficking routes. Nevertheless, crime and violence are serious problems"
Best Places to Live. Mexico is a big country with many interesting regions to live in. While most people from the U.S. tend to see the entire country as dangerous and forbidding, the fact is one should not generalize about a country this big and varied. There are many wonderful places to retire in Mexico - some very popular with expats, and some undiscovered. 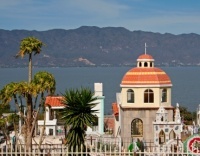 See the list of Mexican cities and towns which we have reviewed at the top right of this page. Mexico Retirement Gone Bad: Why This Gringo Can't Wait to Get Back to the U.S.